We know that horses tend to be calmer when their heads are down. 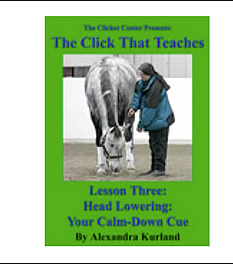 We know that dropping the horse’s head below the withers can have a calming effect, but this lesson takes you much further. It puts an end to barging, rearing and bullying behaviour and helps to develop emotional control. This lesson teaches your horse patience. It shows you how to build duration with the clicker. If you’ve experimented with clicker training, you’ve probably discovered how eager horses become to show off behaviours they’ve learned. That can be great fun at first, but it may not feel very stable. Your horse may feel like an equine yo yo, offering the same bits of behaviour over and over again to earn reinforcement. This tape shows you how to combine the clicker to build duration into the head-lowering behaviour. In the process your horse will be learning patience. He’ll learn that if he wants to earn reinforcement, he has to control his fidgety, fussy, push-into-you, run-for-the-next-county desires. Instead he has to stand quietly waiting for you to click.